Stickers are often thought of as an aesthetic element to packaging, something to attract customers. But sometimes, the functionality of stickers often goes overlooked. However, with clear sticker labels from Lightning Labels, businesses and individuals don't have to fret dependability and practicality. But just because they're clear sticker labels doesn't mean they don't have to be bland or dull. Customizing size, shape and material ensure business or individuals will get clear plastic labels that suit all their needs. Usually, stickers are placed on items to cover something up with a marketing message or personal design. But if businesses or individuals want whatever's beneath to show through or be transparent to the other side, they can order clear custom stickers from Lightning Labels. Clear custom stickers are perfect for displaying information like hours of operation or doubling as seasonal decorations. Our advanced printing processes ensure such stickers are not only high-quality, but executed to your exact specifications. A variety of different sizes, label materials and colors are available to choose from, as well as font and design elements. Lightning Labels has been servicing the printing needs of our customers for more than 10 years. We are extremely proud of our BBB rating (A+) and guarantee your experience with us will be a positive one. 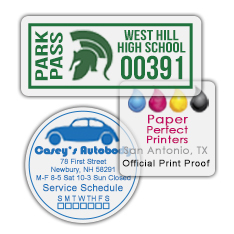 Call us at 888-907-3004 today to place your clear sticker labels order and watch sales skyrocket!